Just about a year ago Foursquare was launching at a NY Tech Meetup. 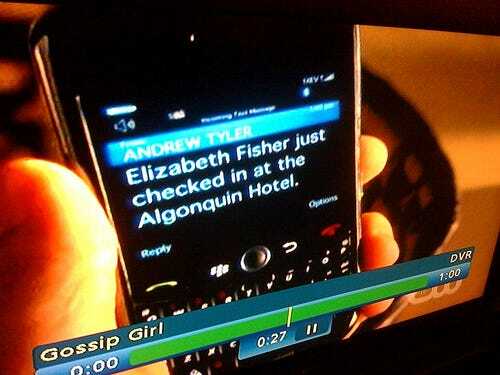 Today, its influence is seeping into popular culture.Last night, Foursquare founder Dennis Crowley tweeted out the screengrab to the right showing one of the characters seeing a check-in at the Algonquin Hotel. It wasn’t through Foursquare proper, but obviously, this is a shout out for the company that popularised the check-in. This isn’t the first time Gossip Girl has incorporated something like this, last year Loopt got a shout-out. The trick for Foursquare is owning the check-in business. With Facebook preparing its own check-ins and Yelp adding check-ins, the teens and 20-somethings that see a generic check-in on TV could associate it with those companies instead. Foursquare needs to be the only company people think of, when they think of checking in. Along those lines, Foursquare is rolling out an update to its website to make it more friendly to the newcomers, says MG Siegler at TechCrunch.